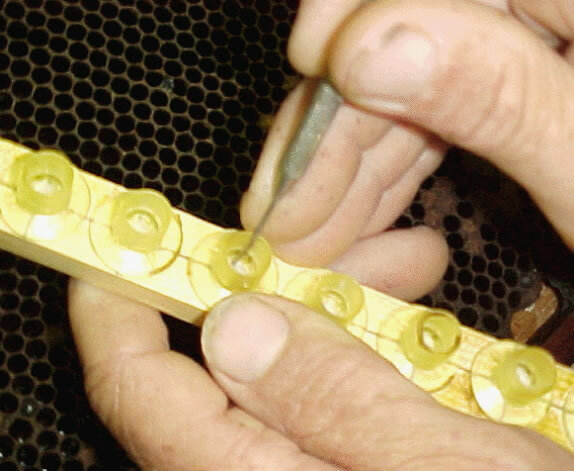 Grafting queens is the process of transferring day old female bee larva from the comb of a breeder queen, into an artificial queen cell cup. 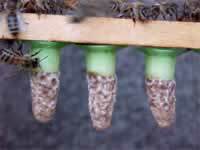 This is the first step in queen rearing, sort of like planting the seed. The young larva is simply lifted out of her natal cell and placed on a small drop of diluted royal jelly in the queen cell cup. Any female larva which is less than about 48 hours old since hatching from the egg can be turned into a queen if fed the proper food by the nurse worker bees. But the best queens are raised from the youngest larva, less than 24 hours old, and about 1mm long. Up to about 50 of these grafted queen cells can be placed in a queenless cell builder colony to be fed and raised as queens. Ten days after grafting the cells are removed from the queen cell builder. The queens will begin hatching out over the next couple of days. Before they hatch, they need to be put into separate colonies or cages to prevent them from fighting. Anytime two queens meet, they will fight to the death of one of them.